The former head of the NAACP is putting social and economic justice at the heart of his campaign. 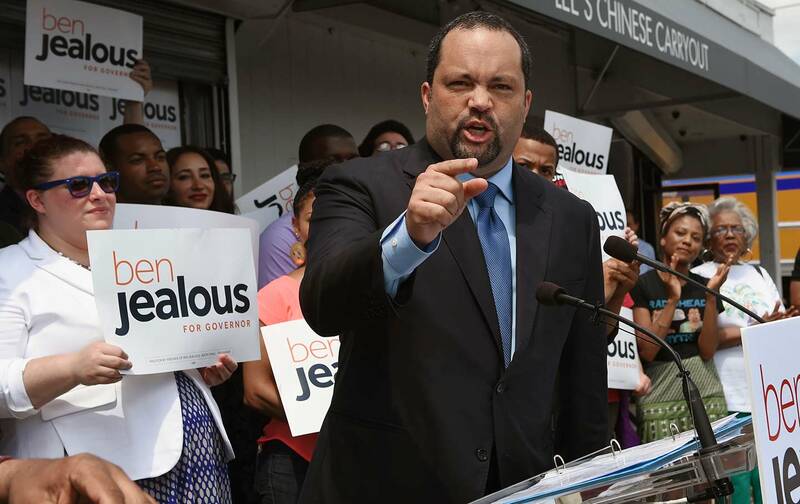 Former NAACP President Ben Jealous entered the race for governor of Maryland with an honest complaint and an audacious promise. In an era when Donald Trump, Jeff Sessions, and Paul Ryan are working feverishly to reverse the progress of the past century, Jealous argues that progressive states are positioned to build the framework for the progress of the coming century. In that unity, argues Jealous, there is the power not just to thwart Trump and Trumpism but to shape an alternative vision for the next American politics. Jealous faces Democratic primary competition and, if he gets the nomination, a challenging political fight with a well-financed Republican incumbent. But he enters the race with a striking résumé and an inspired agenda that is all but certain to make the Maryland contest a key measure of the national mood in 2018. With deep roots in Maryland—his parents were Baltimore educators and civil-rights activists—Jealous speaks of uniting the state around an economic- and social-justice agenda that extends from his groundbreaking work as executive director of the National Newspaper Publishers Association (the federation of African-American community newspapers), as director of the US Human Rights Program at Amnesty International, and as the youngest president in the history of the National Association for the Advancement of Colored People. Jealous has for years earned high praise for his organizing and coalition-building skills, which he put to work as he steered the NAACP into fights for abolition of the death penalty and an end to mass incarceration, for environmental justice and marriage equality. But the Rhodes Scholar has, as well, been a visionary advocate for a bolder and more inclusive American democracy. Jealous worked to address the peril not just by leading the NAACP in opposing bad legislation but by mounting a massive organizing drive to register 375,000 voters and to get 1.2 million new voters to the polls for the 2012 presidential election. And he did not stop there. In his final address as NAACP president, Jealous outlined a voting-rights agenda that he linked to the struggle for economic and social justice. This is the right that has been won by our ancestors again and again. Through the American Revolution, THROUGH the Civil War, THROUGH the Women’s Suffrage Movement, and THROUGH the Civil Rights movement itself. Securing the right to vote for ALL OF US was THE GOAL that Harry and Harriette Moore died for…. that Medgar [Evers] was assassinated for pursuing, that Chaney, Goodman and Schwerner were executed for implementing. This is the goal that so many in this room have risked their lives for. Because we have ALWAYS understood that we are ultimately rendered defenseless when our access to the ballot box is diminished. Simply put, in a democracy, our right to vote is THE right UPON WHICH our ability to defend all of our other rights is leveraged. We have to understand what the other side knows to be true. If they can reduce our access to the polls, it will be harder for us to win any of the other fights that we may hold more dear. Fights for education equity, for health care access…. for equality… for JUSTICE. Voting is the thread that binds the fabric of our Democracy together—pull it hard enough and the whole thing falls apart. With this ruling in Shelby versus Holder it has just become the MOST… IMPORTANT… FIGHT… for ALL of us. This combined faith in the absolute necessity of expanded voting rights and the parallel necessity of an expanded message that excites and energizes voters distinguishes Ben Jealous from most political figures in the Republican and the Democratic parties. He is willing to push harder, to go bolder. He is prepared to resist, but he is also determined to present the vision for what can and must be accomplished when the resistance prevails.